Time for another annual roundup from the world of IP addresses. Let's see what has changed in the past 12 months in addressing the Internet and look at how IP address allocation information can inform us of the changing nature of the network itself. Back in around 1992 the IETF gazed into the crystal ball and tried to understand how the internet was going to evolve and what demands that would place on the addressing system as part of the "IP Next Generation" study. The staggeringly large numbers of connected devices that we see today were certainly within the range predicted by that exercise. Looking further out, it is doubtless that these numbers will continue to grow. We continue to increase silicon production volumes and at the same time continue to refine the production process to decrease the unit costs of these chips. But, at that time, we also predicted that the only way we could make the Internet work across such a massive pool of connected devices was to deploy a new IP protocol that came with a massively larger address space. It was from that reasoning that IPv6 was designed. This world of abundant silicon was the issue that IPv6 was primarily intended to solve. The copious volumes of address space were intended to allow us to uniquely assign a public IPv6 address to every such device, no matter how small, or in what volume they might be deployed. However, the pressures of this inexorable growth in the number of deployed devices on the Internet means that the even NATs cannot withstand these growth pressures forever. 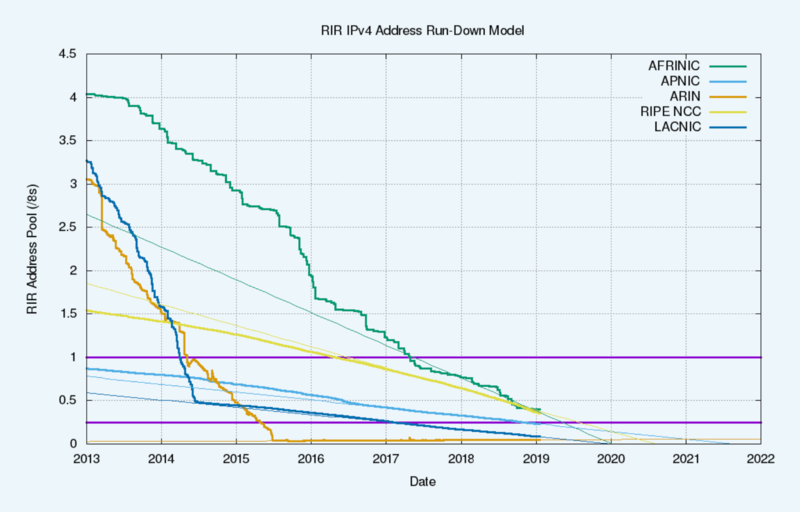 Inevitably, either we will see the fragmenting of the IPv4 Internet into a number of disconnected parts, so that the entire concept of a globally unique and coherent address pool will be foregone, or we will see these growth pressures motivate the further deployment of IPv6, and the emergence of IPv6-only elements of the Internet as it tries to maintain a cohesive and connected whole. There are commercial pressures pulling the network in both of these directions, so it's entirely unclear what path the Internet will follow in the coming years. Can address allocation data help us to shed some light on what is happening in the larger Internet? Let's look at what happened in 2018. In terms of the IPv4 Internet, there is considerable diversity in the situation in each region. 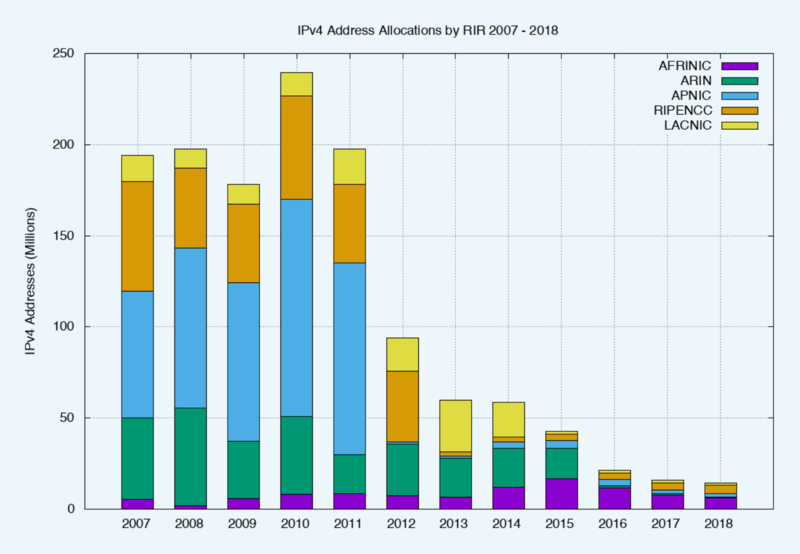 As of the end of 2018, AFRINIC was the last remaining Regional Internet Registry (RIR) with remaining IPv4 addresses available for general allocation, with some 6.7 million addresses left in its available address pool. APNIC and the RIPE NCC have both adopted "Last /8" policies, where each applicant can receive just a single allocation of up to 1,024 addresses from their respective last /8 address pools. APNIC has 3.9 million addresses left in this pool, and the RIPE NCC has some 6.0 million addresses. LACNIC has a pool of 1.5 million available addresses, while ARIN has none at all. The address consumption rate for APNIC has been relatively steady in 2017 and 2018, and at this stage, the pool will last for a further 30 months at this allocation rate (July 2021). The RIPE NCC uses a similar address management policy for its remaining pool of addresses, but the consumption rate is slightly higher than that of APNIC, and it increased in 2018 as compared to previous years, so this pool will last for a further 18 months at its current rate of consumption (July 2020). 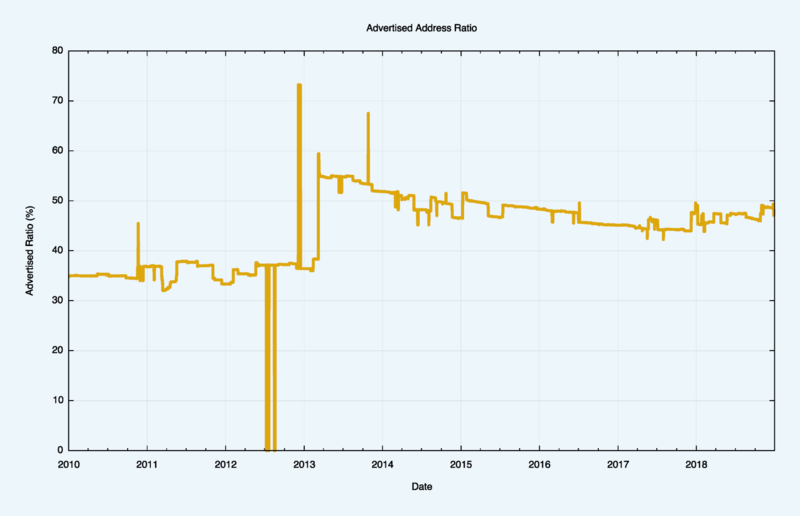 LACNIC's remaining address pool will last for a further 12 months, which is similar to the situation in AFRINIC (according to this projection both RIRs will running out of addresses at the end of 2019). ARIN has completely exhausted its available pool. 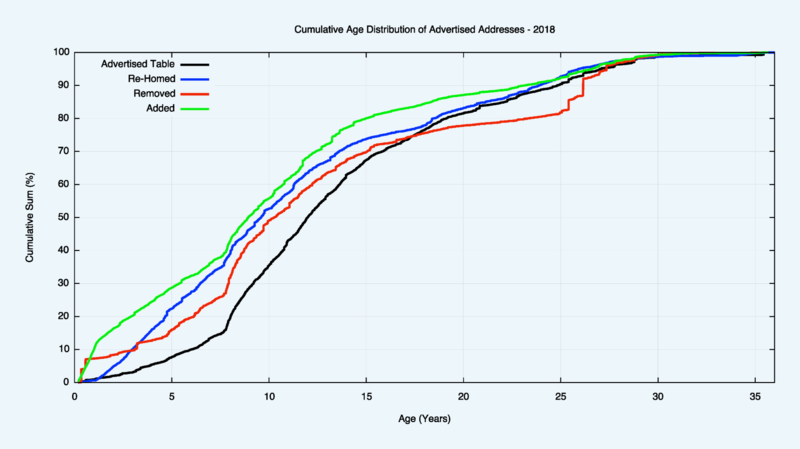 This analysis of the remaining address pools is not quite the complete picture, as each of the RIRs also have reserved some addresses, in accordance with their local policies. There are a variety of reasons for this reservation, including non-contactability of the original address holder, or addresses undergoing a period of 'quarantine' following a forced recovery, or a reservation as prescribed by a local policy. 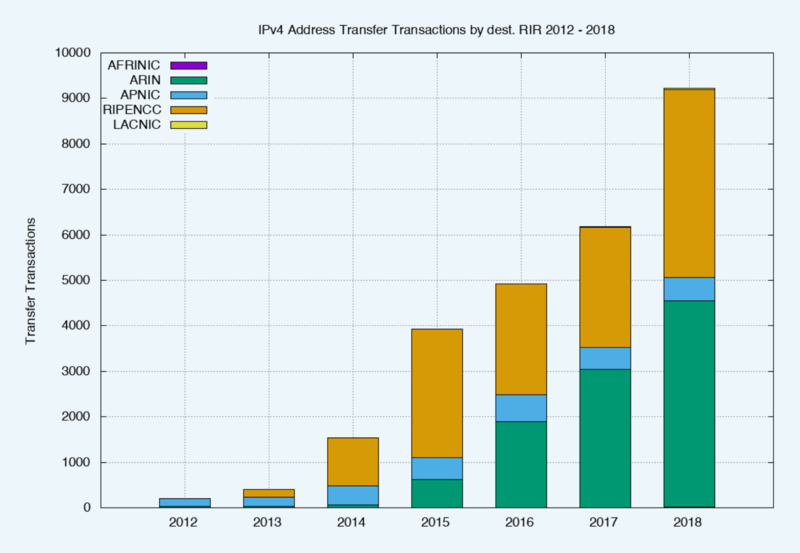 As of the start of 2019, ARIN has 5.9 million reserved IPv4 addresses, APNIC has 4.4 million, AFRINIC 2.0 million, the RIPE NCC has 780 thousand, and LACNIC 1.2 million. The total pool of reserved IPv4 addresses is some 14.2 million addresses in size, or the equivalent of slightly less than one /8 address block Finally, the IANA is holding 3,3288 addresses in its recovered address pool in 13 discrete /24 address blocks. It was thought that by being able to monetize these addresses, holders of such addresses may have been motivated to convert their networks to use private addresses and resell their holding of public addresses. In other words, the opening of a market in addresses would provide an incentive for otherwise unproductive address assets to be placed on the market. Providers who had a need for addresses would compete with other providers who had a similar need in bidding to purchase these addresses. In conventional market theory, the most efficient user of addresses (here "most efficient" is based on the ability to use addresses to generate the greatest revenue) would be able to set the market price. Otherwise unused addresses would be put to productive use, and as long as demand outstrips supply the most efficient use of addresses is promoted by the actions of the market. In theory. There is a slightly different aspect to this question, concerning whether the transferred addresses are predominately recently allocated addresses, or longer held address addresses where the holder is wanting to realize otherwise unused assets. 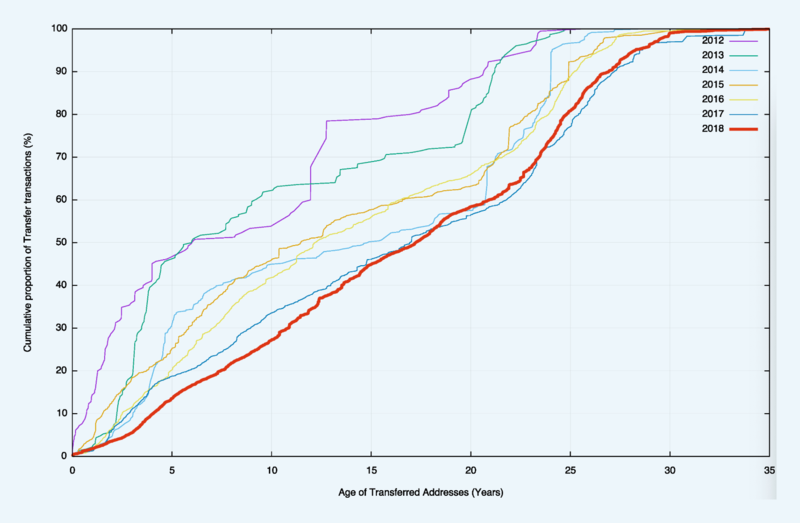 The basic question concerns the "age" distribution of transferred addresses where the "age" of an address reflects the period since it was first allocated or assigned by the RIR system. The second question is whether the transfer process is further fragmenting the address space by splitting up larger address blocks into successively smaller address blocks. 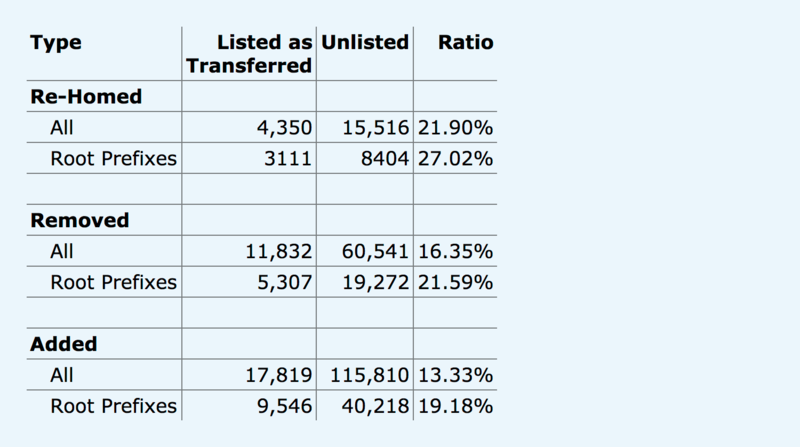 There are 27,426 transactions described in the RIRs' transfer registries up to the end of 2018, and of these 9,809 entries list transferred address blocks that are the same size as the original allocated block. The remaining 17,607 entries are fragments of the originally allocated address blocks. The third question concerns the inter-country flow of transferred addresses. 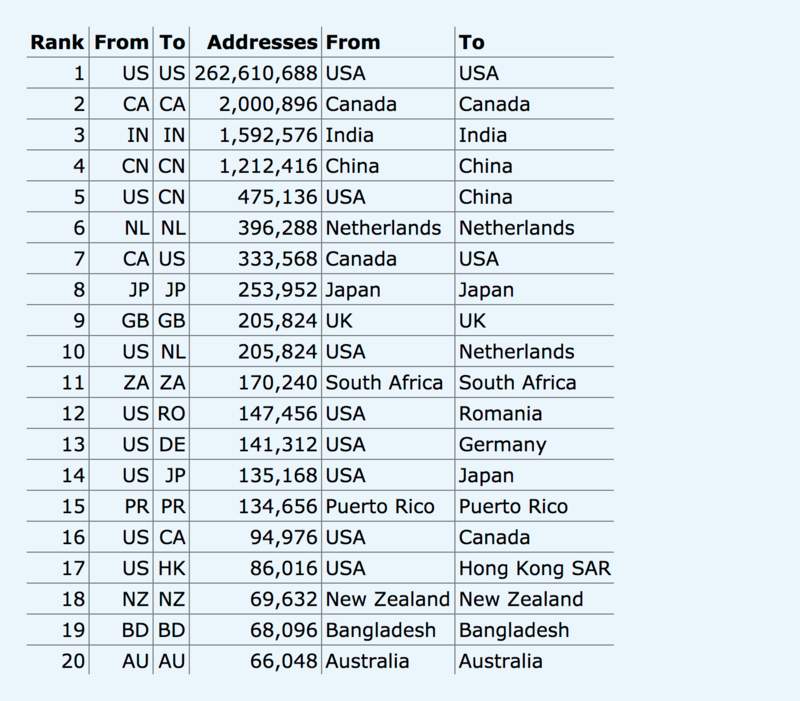 Let's look at the ten countries that sourced the greatest volume of transferred addresses, irrespective of their destination (i.e. including 'domestic' transfers within the same country) (Table 6), and the ten largest recipients of transfers (Table 7), and the ten largest country-to-country address transfers (Table 8). We will use the RIR-published transfer data for 2018. The total volume of transactions that are recorded in the RIRs' transfer logs has 13,707 transactions over the 8-year period from the start of 2011, with 576 million IPv4 addresses changing hands in this manner. 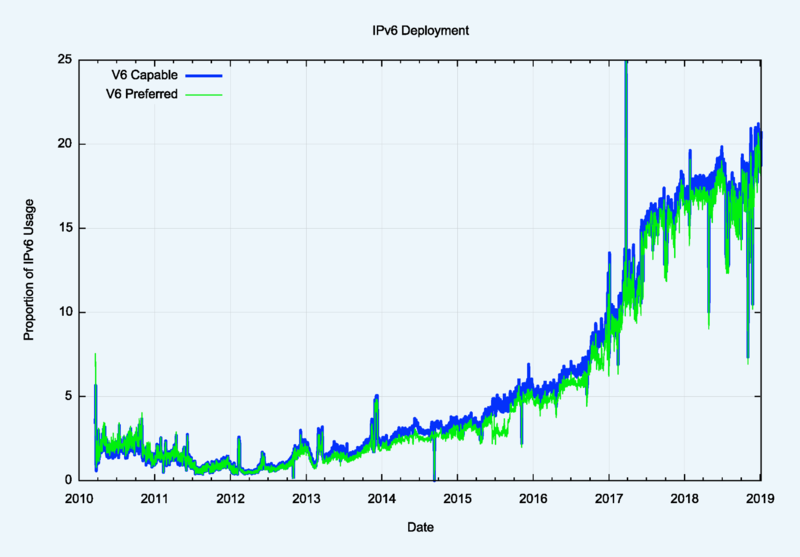 This eight-year total represents far less activity than the underlying pre-exhaustion address demand levels that allocated some 600 million addresses in the three years leading to the 2011 IPv4 exhaustion point. It might be possible to place an upper bound on the volume of address movements that have occurred in any period is to look at the Internet's routing system. One way to shed some further light on what this upper bound on transfers might be is through a simple examination of the routing system, looking at addresses that were announced in 2018 by comparing the routing stable state at the start of the year with the table state at the end of the year (Table 9). While the routing table grew by 61,055 entries over the year, the nature of the change is slightly more involved. Some 72,373 prefixes that were announced at the start of the year were removed from the routing system through the year, and 133,629 prefixes were announced by the end of the year that were not announced at the start of the year. (Within the scope of this study I have not tracked the progress of announcements through the year, and it is likely that many more prefixes were announced and removed on a transient basis through the course of the year.) A further 19,866 prefixes had changed their originating Autonomous System number, indicating some form of change in the prefix's network location in some manner (Table 9). These figures show that some 13-27% of changes in advertised addresses are reflected as changes as recorded in the RIRs' transfer logs. This should not imply that the remaining changes in advertised prefixes reflect unrecorded address transfers. There are many reasons for changes in the advertisement of an address prefix and a change in the administrative controller of the address is only one potential cause. However, it does establish some notional upper ceiling on the number of movements of addresses in 2017, some of which relate to transfer of operational control of an address block, that has not been captured in the transfer logs. 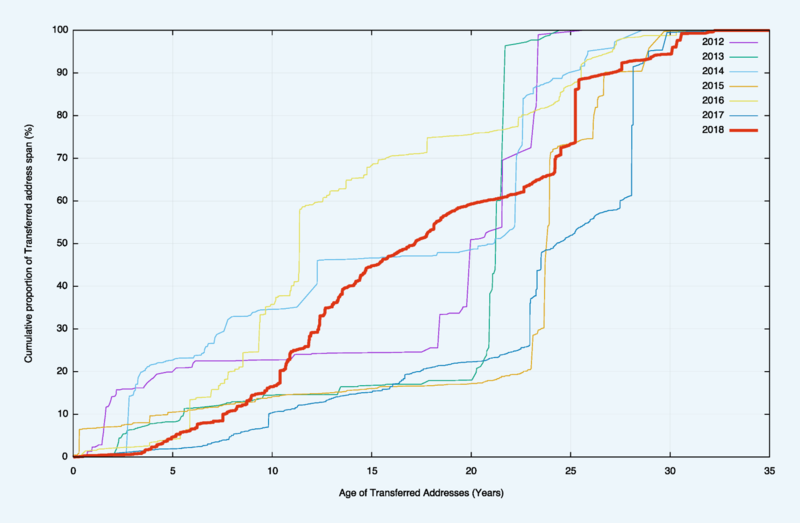 Finally, we can perform an age profile of the addresses that were added, removed and re-homed during 2018, and compare it to the overall age profile of IPv4 addresses in the routing table. This is shown in Figure 9. In terms of addresses that were added in 2017, they differ from the average profile due to a skew in favor of "recent" addresses, and 20% of all announced addresses were allocated or assigned in the past 18 months. 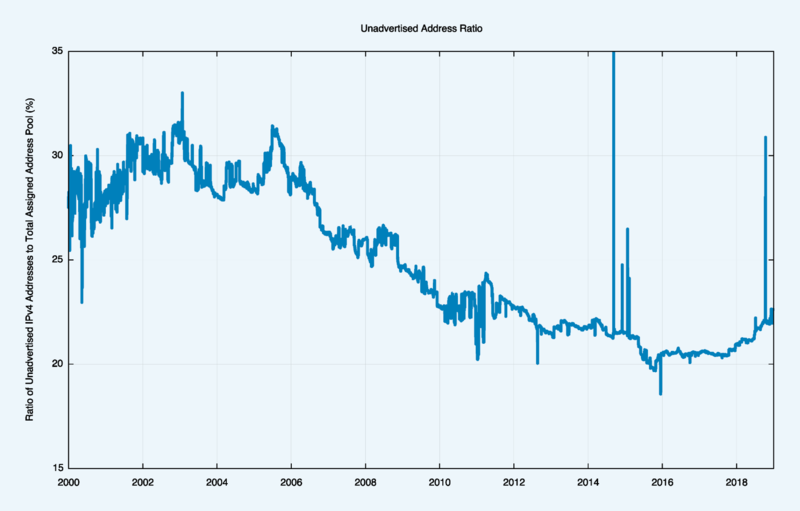 In terms of addresses that were removed from the routing system, there is a disproportionate volume of removed addresses that are between 2 and 10 years old. 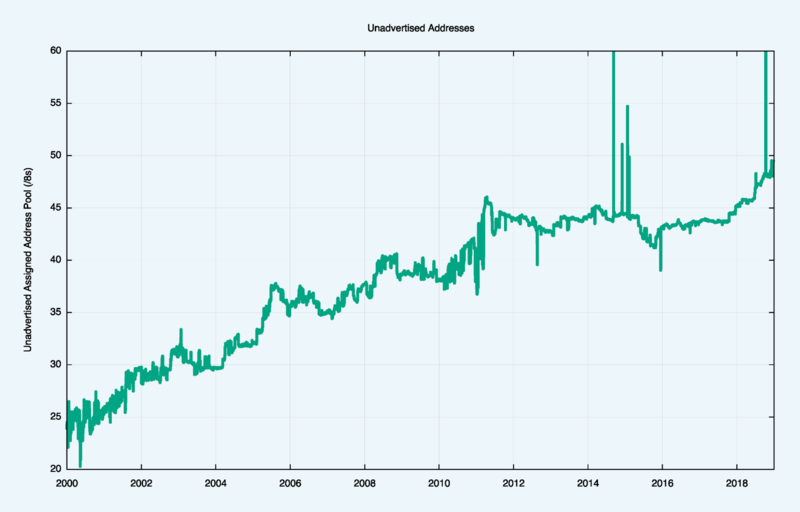 20% of removed addresses are more than 20 years old, where almost 70% of all advertised addresses are more than 20 years old. Addresses that re-home appear to be disproportionally represented in the age bracket of between 7 to 15 years old. 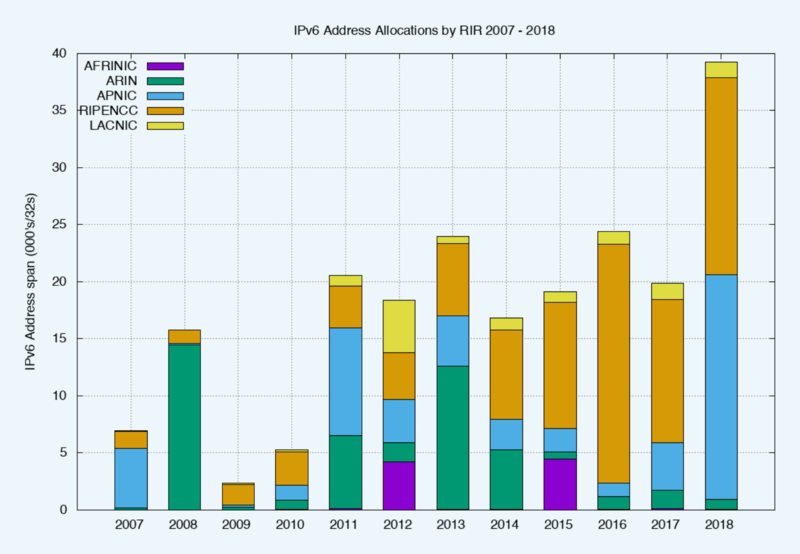 Obviously, the story of IPv4 address allocations is only half of the story, and to complete the picture it's necessary to look at how IPv6 has fared over 2018. IPv6 uses a somewhat different address allocation methodology than IPv4, and it is a matter of choice for a service provider as to how large an IPv6 address prefix is assigned to each customer. The original recommendations published by the IAB and IESG in 2001, documented in RFC3177, envisaged the general use of a /48 as an end site prefix. Subsequent consideration of long term address conservation saw a more flexible approach being taken with the choice of the end site prefix size being left to the service provider. Today's IPv6 environment has some providers using a /60 end site allocation unit, many use a /56, and other providers use a /48. This variation makes a comparison of the count of allocated IPv6 addresses somewhat misleading, as an ISP using /48's for end sites will require 256 times more address space to accommodate a similarly sized same customer base as a provider who uses a /56 end site prefix, and 4,096 times more address space than an ISP using a /60 end site allocation! 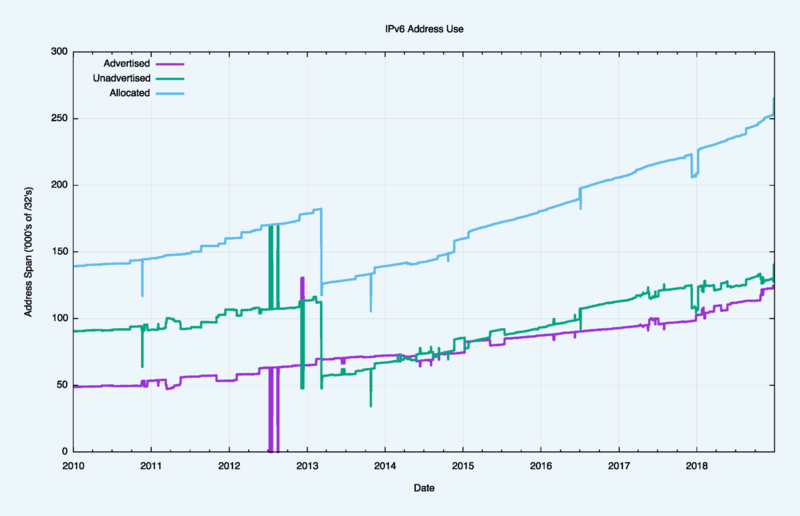 For IPv6 let's use both the number of discrete IPv6 allocations and the total amount of space that was allocated to see how IPv6 fared in 2017. The address assignment data tells a slightly different story. Table 15 shows the number of allocated IPv6 /32's per year. APNIC allocated a larger total in 2018, as a consequence of four large allocations: a /19, 2 /20's and a /22 into China, and a /22 into Singapore. 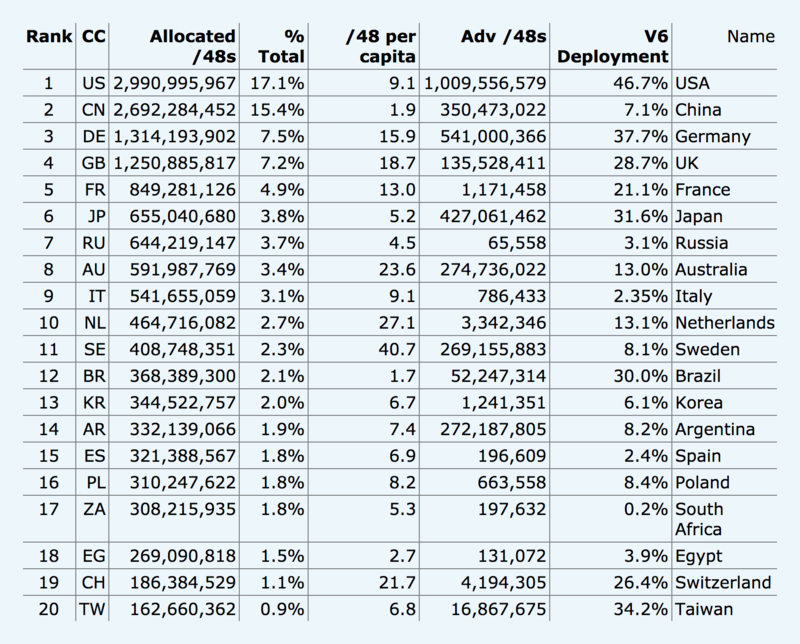 Two of the countries in Table 18 listed as having received the highest volumes of allocated addresses in 2018, namely Russia and Spain, have IPv6 deployments that are under 5% of their total user population. To what extent are allocated IPv6 addresses visible as advertised prefixes in the Internet's routing table? From a history of careful conservation of IPv4 addresses, where some 77% of allocated or assigned IPv4 addresses are advertised in the BGP routing table, a comparable figure of 50% does not look all that impressive. But that's not the point. We chose the 128-bit address size in IPv6 to allow addresses to be used without overriding concerns about conservation. We are allowed to be inefficient in address utilization. Today we have advertised an IPv6 address span which is the equivalent of some 125,000 /32s, or some 8 billion end-site /48 prefixes. That is just 0.003% of the total number of /48 prefixes in IPv6. While a number of service operators have reached the decision point that the anticipated future costs of NAT deployment are unsustainable for their service platform, there remains a considerable school of thought that says that NATs will cost-effectively absorb some further years of Internet device population growth. At least that's the only rationale I can ascribe to a very large number of service providers who are making no visible moves to push out Dual-Stack services at this point in time. Given that the ultimate objective of this transition is not to turn on Dual-Stack everywhere, but to turn off IPv4, there is still some time to go, and the uncertainty lies in trying to quantify what that time might be. In theory, there is no strict requirement for IPv6 to use NATs, and if the mobile world were deploying dual-stack ubiquitously, then this would be evident in the IPv6 address allocation data. And we see this in India, where the rollout of the Jio mobile service through 2016 and into 2017 has now encompassed some 90% of their considerable user population. The deployment in India has been accompanied by a conservative use of IPv6 addresses. The 107 million/48s allocated to date to India equates to 0.1 /48's per capita, a number far lower than any other economy with significant IPv6 deployment. We are witnessing an industry that is no longer using technical innovation, openness and diversification as its primary means of propulsion. The widespread use of NATs in IPv4 limit the technical substrate of the Internet to a very restricted model of simple client/server interactions using TCP and UDP. The use of NATs force the interactions into client-initiated transactions, and the model of an open network with considerable flexibility in the way in which communications take place is no longer being sustained in today's network. Incumbents are entrenching their position and innovation and entrepreneurialism are taking a back seat while we sit out this protracted IPv4/IPv6 transition. What is happening is that today's internet carriage service is provided by a smaller number of very large players, each of whom appear to be assuming a very strong position within their respective markets. The drivers for such larger players tend towards risk aversion, conservatism and increased levels of control across their scope of operation. The same trends of market aggregation are now appearing in content provision, where a small number of content providers are exerting a completely dominant position across the entire Internet. In Table 5, the volume of LACNIC addresses transferred in 2018 is incorrect. The actual number is far higher, although still anemic by any standard. LACNIC must remove section 5 from their RSA, which gives them the right to review allocations and revoke them if they aren't being used. This right inhibits sellers from advertising their inventory. Thanks for the careful read of this detailed article Mike. Yes, the LACNIC transfer logs show a total of 83,968 IPv4 addresses transferred in 2018. I have to agree with you that this is still a pretty low number for a populous region that has run out of addresses some years ago and is likely to be operating under some significant scarcity pressure. Local Time: Friday, April 19, 2019 03:31 AM PDT – Page Load: 0.3752 Sec.